Underneath Gurath's helmet is an unseemly visage. His face twisted and distorted from his heritage, a short, broken nose is set in the middle of an oval face, with pale orange-grey skin and two large, sunken, circular eyes. His mouth spreads from cheek to cheek with sharps fangs that dwell within, should all other options be exhausted, he could bite the face off a human being with ease. He wears such a concealing helmet for both embarrassment and protection. It would take a very powerful strike to harm his skull. Gurath is not one to wait for his opponent, he will strike first and deal with the consequences later, his vision is narrowed due to his helmet however so this usually ends with him obliterating a stone or wall instead of his opponent. 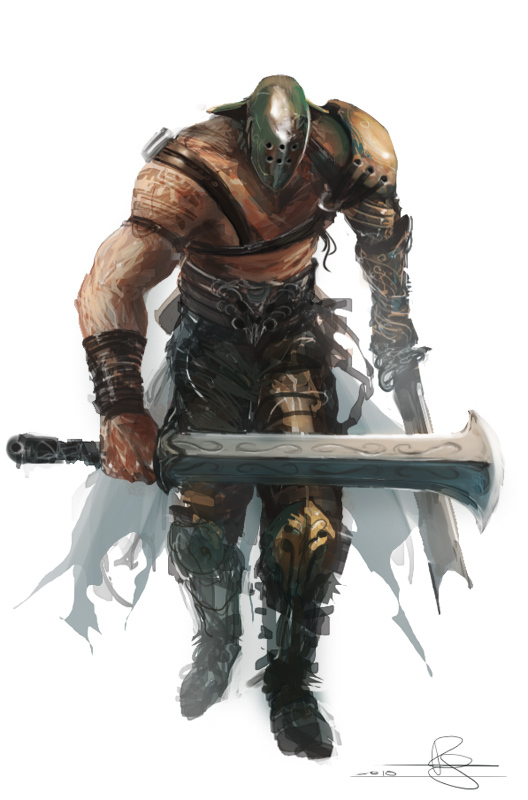 This gigantic warrior wields two blades, one with a widened head for heavy strikes, the other designed for decapitation via the end of the blade, the half circle groove is incredibly sharp and strong, and he is known for using it, thus his title of 'Executioner'. Headbutt: Gurath can use his heavy helmet and powerful neck muscles for an intense strike, capable of breaking bone. Shoulder rush: This behemoth rushes forwards, armored shoulder lowered, in order to pulverize those who might be caught within the veritable freight train's path. Enhanced sight: Gurath's eyes are more sensitive to light than most humans. In bright environments this can be a detriment. Sleeplessness: The Half-Giant doesn't sleep much, perhaps this contributes to his lack of cognitive abilities, perhaps not. Jabby: A short sword with a length of twelve inches, some would argue that this polished blade is merely a large knife, Gurath would disagree. Four eight inch blades are also on his person, two strapped to each calf. Helmet: Gurath wears a thich metal helmet, for both protection and offense. Shoulder Pauldrons: Two slabs of curved metal adorn his shoulders, he uses these for protection, as well as rushing. Hardened leather armor: Leather armor adorns his chest, metal having been foregone for the sake of mobility. Metal boots: Heavy metal boots secured snugly to his monolithic feet allow for traversal over rough terrain, and a deadly stomp. Rain, nothing but torrential rain. It was a summer deluge, the droplets warm on the men’s brows as they stalked through the field of wheat. Pikes in hand they set their eyes on the target, an old barn, with gaps between every few planks and a shoddy frame that looked near collapse. It was the definition of rural, nothing for miles but fields and a house, yet even over such a great distance, the powerful wails of pain from within the walls of the old barn were heard from the nearest town. Half an hour before the men arrived the wailing had ceased. Now, from a distance of around a hundred meters or so, the pike wielding town-guard heard nothing. Whatever it was it had sounded big, and it was close enough to be a threat. They couldn’t wait for the King’s men for this, they had to do it themselves. The Farmhouse was dark, no movement could be discerned by the trembling militiamen. The Farmers had either hunkered down, fled, or died. The lead man was probably twenty feet from the barn door, each step getting harder and harder to justify, when he heard an infant’s cry. Steeling himself, the man pushed the door open. At first he could not see, the mere illumination from the cracks in the ceiling were not sufficient, he could hear slight rustling, and the continued crying of a babe. He thrust his hand out behind him, beckoning for a torch from one of the two men with him that carried one, but they were not with him. He turned and glanced back into the field when a torch was not forthcoming, to see two fiery lights quickly disappearing over a small hill. The man sighed, exasperated, he set his pike against the wall of the barn, convinced that nothing inside was going to attack him, he then pressed his palms together and fell into concentration. A white light began to form between his hands, a ray of light then burst from them. He pulled his palms apart to reveal a bright ball of light levitating over his open right hand. His face was then revealed in full, he was a man in his mid thirties, with a black mustache and a tinge of grey scruff on his cheeks, he was of a medium build with hardened cloth armor adorning his chest, arms, and legs. The light also revealed the contents of the building, the center of it was occupied by a massive woman lying prone on her back. A tattered tunic of deerskin barely covered her eleven-foot frame. Her legs were sprawled apart, the deerskin covering something that moved beneath, the whole area was saturated with blood. The man carefully moved around the woman, her chest was beating but so shallowly that he was sure every motion would be the last. “Ma’am?” He asked in her direction, her eyes drifted open, they were an ocean of blue, her features were delicate despite her size, sweat and tears had stuck long brown hair to her angular face. “Please,” she rasped, “Take care of it...don’t...don’t let them...” With that she lowered her eyelids, and her breathing became even more shallow. The man fled the barn that night, a large squirming bundle wrapped in tanned deerskin was swaddled in his arms. Gurath grew up a mutant, a freak, because of the sins of his father, he suffered greatly. His horrific face only adding to the torment he received. This mountain of a man spent his early childhood in an orphanage, rather, in the attic of an orphanage. The caretakers thinking him unworthy to associate with the other children, some of them wished to leave him by the roadside, others had some smidgen of mercy for the unusual boy. Two in-particular, a woman, by the name of Katrina, and a man, who was known as Brahm. These two would always be the ones to bring him food, and stay with him when he was outside. The reason for their company was both compassion and protection, the other caretakers weren't the only ones who saw him as a demon, on a few occasions men with hoods had attempted to climb the great stone wall and slay the child. The last of these attempts, was the reason for his departure, when Gurath was about fourteen, he stood at 6'5, and most feared he would not stop growing, that he would soon become too powerful to stop, and so they attempted to end him. Under cover of darkness they crept across the lawn, five of them in all, hoping to kill the beast while he slept. Unfortunately for them, Gurath required little sleep, for some strange reason four hours of slumber was all it took to sustain this massive individual for weeks on end. He was awake when they came, in the dead of night they had scaled the stone building and entered through the only window in his attic room. The inside of the room was blacker than tar, their human eyes could barely see an inch in the darkness, but Gurath's large, circular eyes enveloped the environment, he saw it clearly. There were some shuffling noises in the room, the humans thinking it to be one of their own, but it wasn't, taking the risk of being discovered, which was not a great risk in the first place as most of the town wished to be rid of this creature, the men lit a torch, the sudden illumination revealing to them, a hulking demon straight from their nightmares. A disappointed frown adorned Gurath's face as he held one of the humans by the throat, the limp body already having had the life choked out of it. With ease the beast-man threw the corpse to the side and brought back one of his humongous fists, throwing it forwards to cave in the face of a second man, who screamed through a broken jaw as Gurath shoved him out the window to plummet twenty-five feet to the ground below. The other three had now regained their composure, and the one with the torch stepped back as the other two pulled swords and surged forward. Gurath ignored the blades, side stepped the men and kicked one of them hard in the chest as he passed, breaking a significant amount of ribs. He then seized the torch which the next man was holding and snapped his neck with a heavy sideways blow from his right forearm. The last man turned from his charge and moved to strike at Gurath, who quickly thrust the torch forwards into the mans face. The attacker screamed and stumbled, Gurath crowded him towards the window and pushed him out, to splat onto the ground next to his friend. Gurath then tossed the torch on his bed and the flame began to spread. He knew it was time for him to flee, and so he did, out the window and down the street, leaving a burning orphanage in his wake. Last edited by Maur on Wed Dec 05, 2018 6:39 pm, edited 1 time in total.